David Rogers (Vocals/Guitar): Widely known as the Dan Rather of jangle pop. Alex Deutsch (Bass/Screams): School psychologist by day, Bass Master General by night, Alex cut his teeth playing in punk bands and now brings that raw energy to the Jangle Pop party for everyone to enjoy. 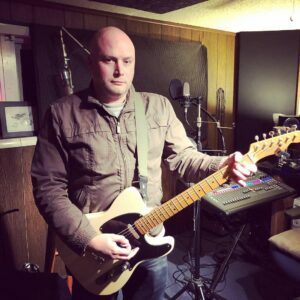 Troy Crossley (Guitar/Vocals): Troy fronted indie folk and jam bands in Northern Virginia before moving to Asheville and bringing his unbelievable musical prowess and white-hot stage presence to Modern Strangers. 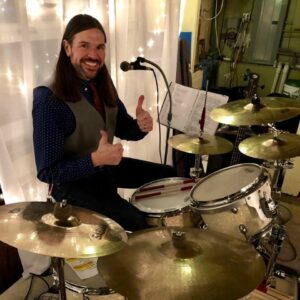 Courtney Cahill (Drums/Vocals): Before moving to the mountain paradise that is Asheville, Courtney provided the thundering beats and screamy background vocals for several Detroit indie rock bands. Courtney is also a proud dad of 2 boys, husband and IT professional. Modern Strangers is an Asheville-based rock band playing fun, high-energy, dance-friendly Melodic Rock/Jangle Pop music! A 4-piece combo of journeyman musicians, they take their varied influences and form them into a Jangle Pop juggernaut. They often draw comparisons to REM, Elvis Costello, Violent Femmes and The Kinks. Catchy songs, vocal harmonies and just the right amount of edge make these guys a fun night whether they're playing originals or quirky covers. Don’t forget your dancing shoes! David Rogers and Courtney Cahill first met on a dark December night in 2012. They immediately hit it off and started to put together what would become the core of the Modern Strangers repertoire. David had been writing a set of tightly composed, catchy pop songs somewhere in the vein of The Beatles, The Kinks and Weezer. 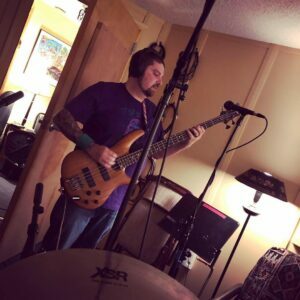 Courtney came in ready to go with years of experience backing high-energy indie rock bands. This natural combination of well-crafted songs and a tight powerful beat brought Modern Strangers together quickly and they were ready to go alongside some very talented band mates. However, line-up changes and many other harsh realities of being a responsible adult kept hindering the project from taking off. That changed in 2016, When David and Courtney decided to take this seed of a great band and really germinate it into something. They just needed to build a band that could help them realize that dream. Recruiting Alex Deutsch to fill in the vacant bass guitar role was the first step. Alex came in hot with blazing fast licks and a punk rock energy that immediately relit the fuse on these tunes. They had always been up-tempo numbers, but now they were UP TEMPO numbers and Alex made it his personal mission to lay down a catchy bassline to get people up and dancing. From the moment the band saw Troy Crossley take the stage at an open mic in town, it was clear he was a special talent. Unique and impressive guitar picking with a soulful original voice made everyone take note. Offering him the lead guitar role on the spot was a no-brainer; letting him run with it was a stroke of genius. Troy’s musical intuition was apparent from day one, when he started throwing in perfect harmonies and tasteful guitar parts that fleshed out these bare-bones pop tunes into something more. 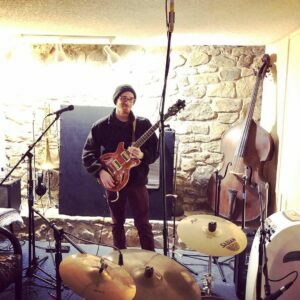 Troy’s skillful songwriting and vocal ability brings a classic and nuanced jazz and folk influence into the mix, which is a perfect and surprisingly natural addition to the Modern Strangers set. In an age where the lines between genres have been all but erased, it is painful to hear a band describe its own sound. We will try to keep it brief and accurate! Modern Strangers plays straightforward, melodic Pop-Rock music. Our sound prioritizes a tight, accessible “pop” song structure, high energy delivery, melodic hooks, vocal harmonies, and highly danceable beats. We love when a new listener compares us to one of their favorite bands. We are compared often to Elvis Costello, The Kinks, The Beatles, Spoon, early REM, Violent Femmes, Squeeze and a long list of other bands that all string together three chords into tight, focused pop songs centered around melodic hooks. Under the hood, we are driven by a “Punk Rock” rhythm section (at turns driving and bouncy, but always high-energy), raw and soulful vocals, and of course JANGLY guitars. Collectively, we draw inspiration from a wide mix of sounds and genres. We borrow sounds that catch our attention, and we incorporate unmistakable elements of Rock & Roll, Folk, Country, Soul, Honky-Tonk, Americana, Punk, Jazz, Indie Rock, etc. But at the end of the day it’s still straightforward Pop-Rock music designed to catch your ear and get you dancing (and singing) along. We like to call it Jangle Pop. Modern Strangers' mission statement is to put on a fun live show!! Asheville, NC, has more than its fair share of talented musicians putting on epic live shows melting faces all over town on any night of the week. Modern Strangers is not looking to compete in that realm. Modern Strangers presents a show that is meant to lighten your load and get you dancing (or at least tapping your toes). Danceable rock music is not easy to find anymore, and that is why people will compare Modern Strangers to bands from the 60s or 80s. With sets compromised of catchy original songs or quirky covers, crowds around Western North Carolina have come to expect a Jangle Pop party when these boys hit the stage. Modern Strangers has appeared at The Orange Peel (Gin Blossoms opening set), The Grey Eagle, Salvage Station, New Mountain, New Belgium Brewing, Altamont Theater, Jack of the Wood, The Mothlight, Upcountry Brewing, The Odditorium, Sanctuary Brewing, Blue Ghost Brewing, Innovation Brewing, Town Pump, No Name Sports Pub, The Ugly Dog Pub (both Highlands and Cashiers), Oscar Blues Brewing (Brevard), 5 Walnut Wine Bar, Boojum Brewing Company, Yee-Haw Brewing (Greenville) and many, many more!